Multum in Parvo is a Latin phrase which literally means, ‘much in little’. But what it really implies is a richness that speaks beyond and outside of an objects’ present confines. ‘There is more than meets the eye’. Phrases like these spark the imagination because the phrase itself is a condensed expression that speaks of endless possibilities, inviting the listener to satisfy his curiosity by seeking more. I see multum in parvo as an invitation to a voyage, taking Baudelaire’s title from his poem. Like his poem, we are enticed into a personal dream of foreign voyages, of riches found and of creative engagement that spans two worlds, one that is conscious and one that remains on the shadowy edge of consciousness, wrapping us in deep emotions. All poetry falls within multum in parvo and so does painting. In painting one can never express fully all that there is to say or feel. A painting just invites us to seek more, to look again. The medium of painting acts as the portico, the threshold one passes through, into a world one recognizes as their own yet is unable to fully possess. A painting secretly whispers those things one cannot put into words, things too elusive and fleeting to be shaped into thought. Yet they are spaces of profound emotion and subtle insight. I like to think of the pochade as a multum in parvo, par excellence. A pochade, a small, quick painting, acts as window into a world where one can only see but a part, yet one knows intuitively that there is more. 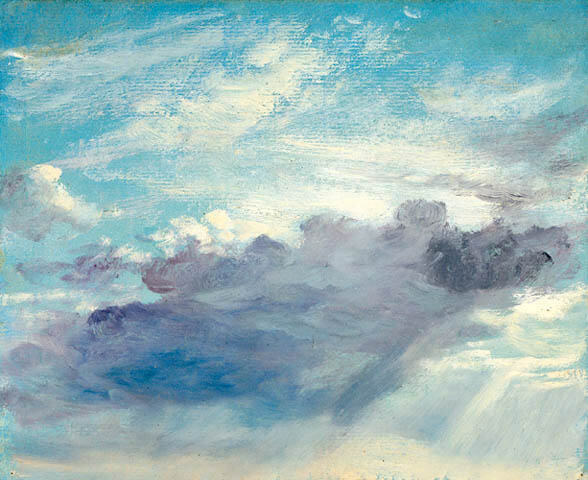 I love Constable’s small studies of clouds. He did hundreds of these. There is an illusion of an expansive space expressed in the movement of the wind and cloud formations. There is a vastness here that catches one by surprise. The frame cannot hold all this immensity in. Multum in parvo also expresses a kind of ‘enchantment’ found in small objects almost like a miniature. In Medieval manuscripts, artists would paint small, beautiful images hidden between the pages. I can imagine how one felt that while they were reading a text, they would suddenly turn a page and come upon a beautiful window, a portal between their own world and the one they wished to have magnified within them. There would be a shock, a sudden awareness of grandeur and immensity. I like to think of a pochade as these jewel like spaces that seek one’s attention away from the everyday particulars and embark on a journey to seek more. Next Next post: What Does it Mean to be a Master?